“How About Never–Is Never Good for You? : My Life in Cartoons” is a very long title but it does two important things. It’s funny and it’s memorable. Just what you would expect from Bob Mankoff, the cartoon editor of The New Yorker. 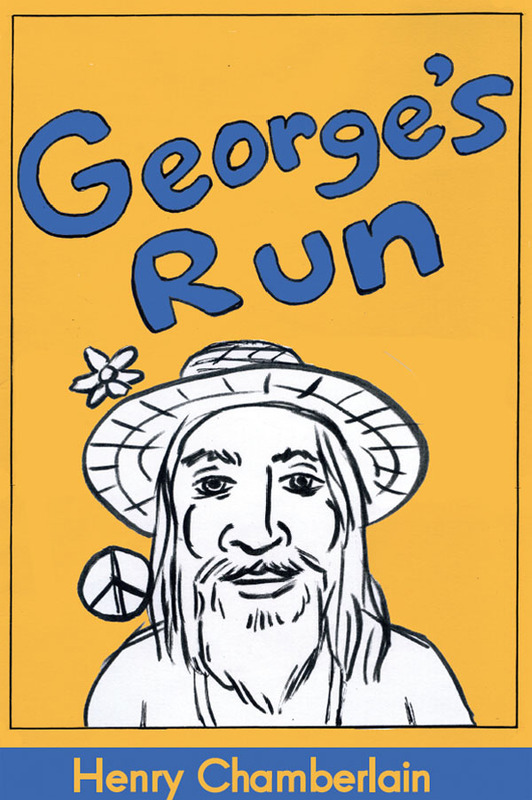 Paradoxically, we all know a New Yorker cartoon when we see one but there really isn’t a typical New Yorker cartoon. 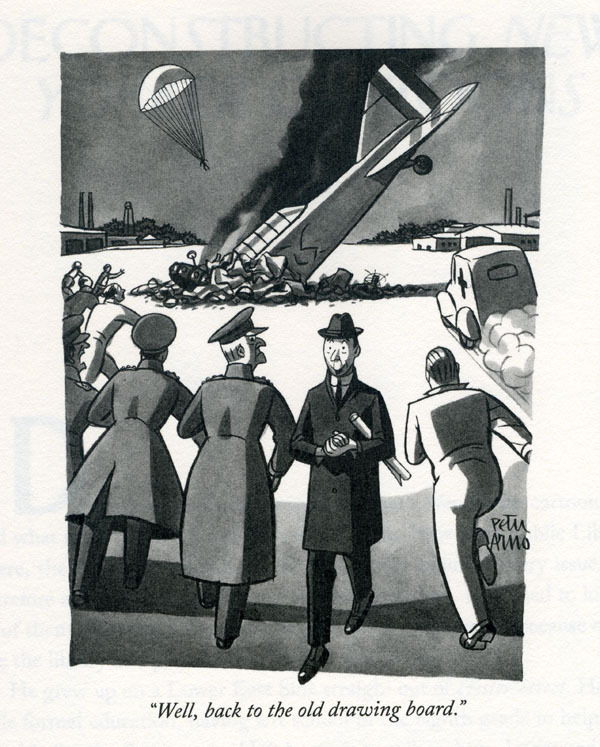 It takes someone like, Bob Mankoff, the cartoon editor of The New Yorker, to explain that one. And why settle for someone like Bob Mankoff when you can have the real thing in his latest book. 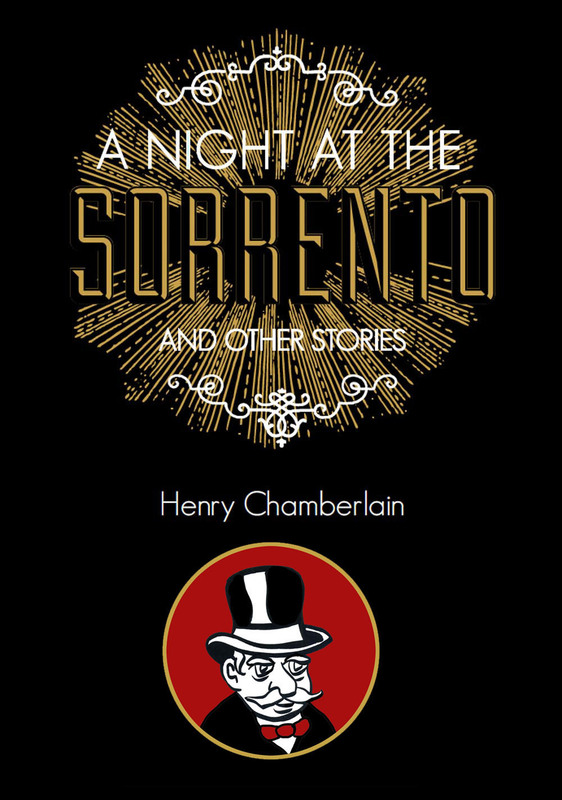 If you really want to know what it takes to get a cartoon published in The New Yorker, then this book will answer that along with a lot of other things about the human condition. And, by the way, it takes someone sensitive to the human condition to get published in The New Yorker, let alone make a career out of it. This is where Mankoff has a leg up on many an aspiring cartoonist. He was most assuredly a sensitive and inquisitive youth. Although you could say that anyone truly interested in cartooning is already sensitive, but I digress. What is clear is that Mankoff is the sort of person who loves life and has a burning desire to express himself. Part of that desire came from his mother and part came from Jerry Lewis. 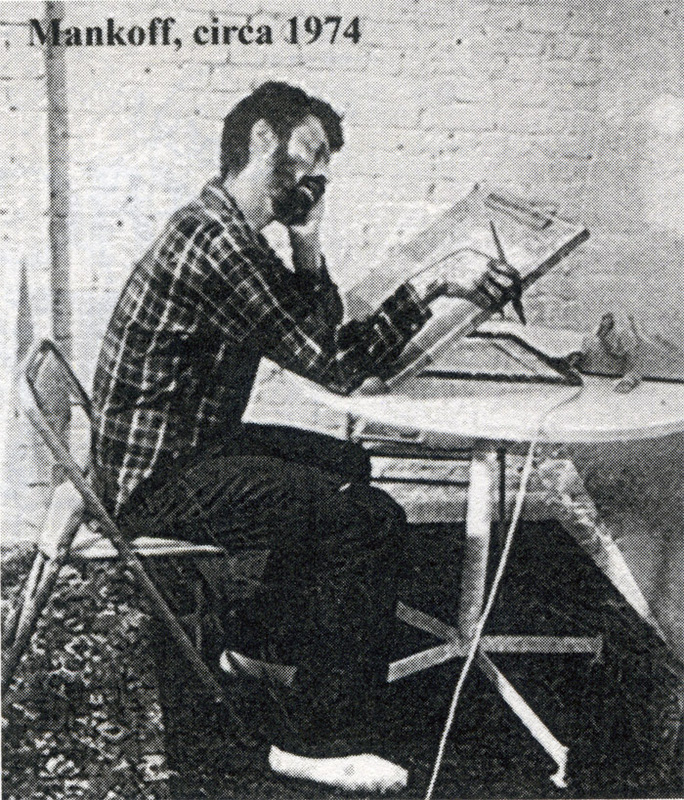 It was never a forgone conclusion that Mankoff would develop into any kind of artist. It was a combination of things, not the least of which was his Jewish upbringing, that gave him the strength and sense of humor to persevere. He would have loved to have pursued art as a youngster but he didn’t see himself as talented enough. It would be years later, once he was well on his way to getting his PhD in Behavioral Psychology, that he pursued cartooning. What he discovered was that he was good at it and was able to sell cartoons to such notable magazines as The Saturday Review. 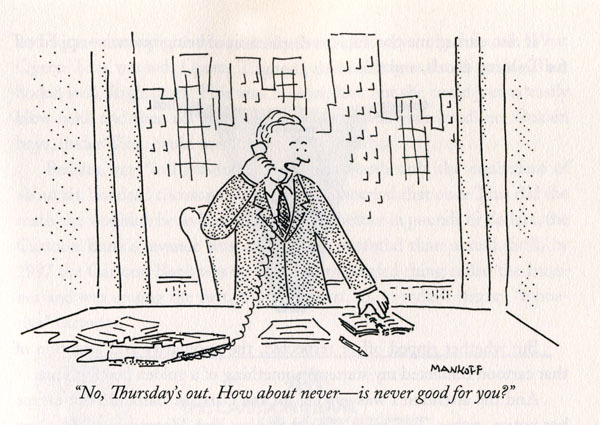 And, after 2,000 rejections, he finally got a cartoon published in The New Yorker in 1977. What we learn about cartoons from Mankoff relates to just about everything else, as we go from the specific to the general. New Yorker cartoons reflect human nature. They do such a good job of it that we feel we already know all about them. But, in the end, there is no magic formula to creating a New Yorker cartoon. If there is a secret to their success, then it lies in the fact that they are created by individuals, each with their own unique vision. Mankoff is clearly excited about sharing what he knows. He shares his views on humor theory. He explains that there are “head” cartoonists and there are “hand” cartoonists: one is a master of the concept; the other showcases the artwork. And there are cartoonists who will only doodle during the first stage of creation while others will only write. Mankoff is genuinely fascinated with The New Yorker as an institution and an active player in the culture. To have a New Yorker cartoon become a catch phrase is the highest honor that can be bestowed upon that cartoon, that cartoonist, and The New Yorker. In a book full of cartoons, photographs, and diagrams, Mankoff is not shy about providing examples. Speaking of examples, he provides us with an in depth look at how The New Yorker has become part of the culture. Three prominent examples: Carl Rose and E.B. 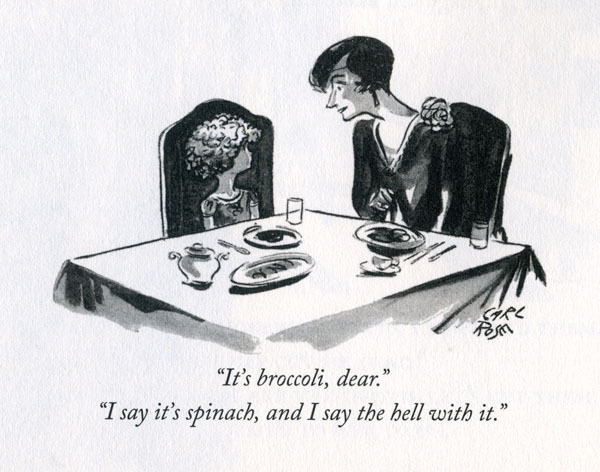 White’s “It’s broccoli, dear” “I say it’s spinach, and I say the hell with it,” from 1929; Peter Arno’s “Well, back to the old drawing board,” from 1941; and Bob Mankoff’s “How About Never–Is Never Good for you?” from 1993. All three of these cartoons are bona fide hits: they made it not only into the lexicon of the media but broke into the lexicon of the general public. Do you harbor a desire to have a cartoon published in The New Yorker? Well, get in line. 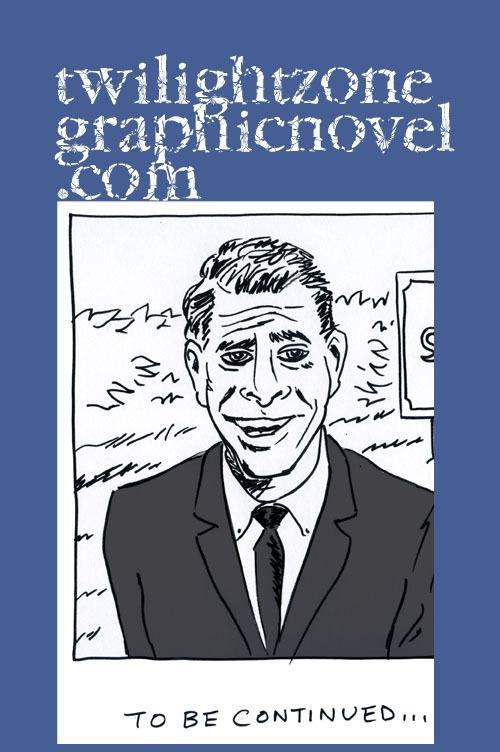 Even if you do get a cartoon published, that doesn’t mean you’re truly a New Yorker cartoonist. Try getting consistently published year after year. Then you might lay claim to that title. However, there might be a slightly easier way for you to get your cartoonist side to shine by entering The New Yorker caption contest. Mankoff is eager to help. He actually shows you how you can better your chances of winning. It has something to do with really trying. And that’s the best advice you could give about New Yorker cartoons, and life in general. It’s always good to really try. “How About Never–Is Never Good for You? 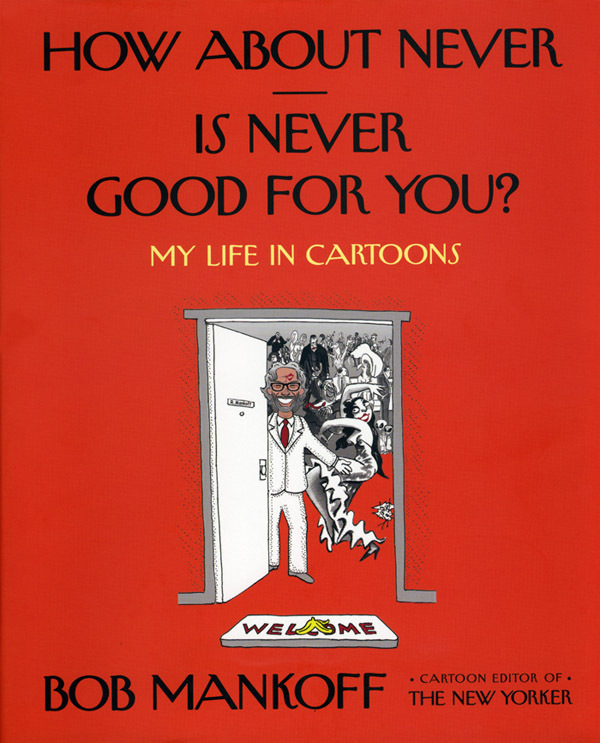 : My Life in Cartoons” is a 304-page hardcover book published by Henry Holt and Company. You can get your copy here.